A travel bidet is a small, portable bidet that can be carried around inside a purse or small bag. Travel bidets can be used at work, for travel or business trips, during outdoor activities, at public toilets without bidets, or for infants. 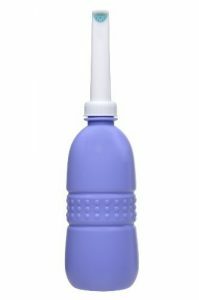 Most travel bidets feature a squeeze bottle and nozzle. The bottle is filled with water just before use. Some travel bidets can be pre-filled with water and operate with a switch and batteries.